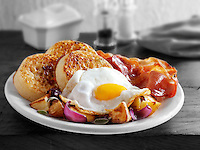 Crumpets food pictures, photos & images. 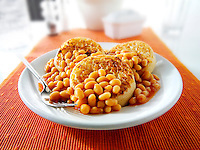 A popular British dish, especially in the winter is the crumpet. 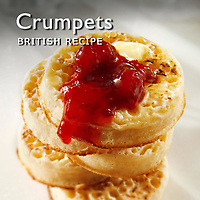 Crumpets may have been an Anglo-Saxon invention. An early reference to them comes from English Bible translator John Wycliffe in 1382 when he mentions the 'crompid cake'. The early crumpets were hard pancakes cooked on a griddle, rather than the soft and spongy crumpets of the Victorian era, which were made with yeast. 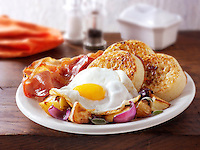 Crumpets are made from a flour, butter and milk batter to which yeast and baking soda is added. 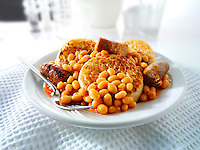 They are then cooked on a greased griddle in crumpet rings. 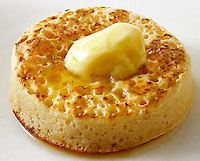 The batter rises to produce the crumpet. 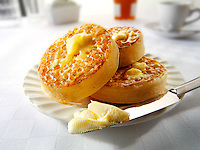 Crumpets can be bought in bakeries then grilled and dated with butter. 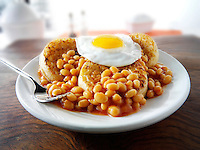 they can also be topped with cease or baked beans. On cold winters afternoon they make a classic tea time meal.